A wide range of web hosting support providers are available in a range of few dollars a month to thousands of dollars among us.Choosing your best support provider is one of the most challenging things you face as a web hosting company. Unfortunately, choosing the best isn’t as simple as picking one from a list. Also one of the most time consuming tasks when you run a hosting company. Customers looking for a web host which is stable, both in terms of their servers as well as network connections. 99.95% is considered a norm these days which relay on the support team. All web hosting companies prefer white label support where support is fully transparent, so their clients don’t even know a third party support team is sandwiched. Your reputation is everything as a web hosting company. Your company and white-label team you choose will be representing you, so it’s highly recommended to know exactly about your partner. Now! How do you trace the best? All basic support service provides access to email, ticketing system,live chat and some over phone support. Now your choice, How much time you need the support? 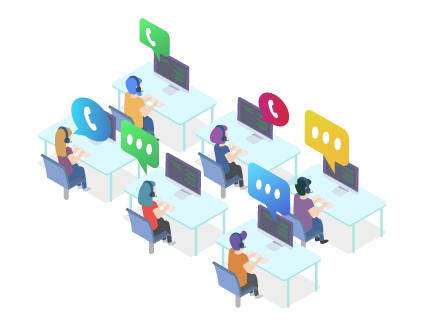 Major support teams will have tailored plans for your needs, which depends on how much average traffic(tickets/chat) you expect or currently have? and the number of servers you are holding?. If you are having huge number of tickets/chats, definitely need to delegate the management of your site completely, and need a dedicated team. Sysally always customized to fulfill your hosting support needs in the best possible way. You can select a team of SysAlly web hosting support engineers specific to your hosting needs. “It takes 20 years to build a reputation and five minutes to ruin it. If you think about that, you’ll do things differently”. Be vigilant and don’t waste your precious time on spending support teams with poor reputation and track record. You always need a trustworthy and customer-centric tech support partner to rely on. SysAlly has been delivering quality outsourced tech support for web hosting service providers since 2008. If you are running small scale business with few number of servers, without complex customers, ( like customers are running only wordpress or any other open source website creation tools ) shared support can top-notch. At that point you only have to pay for services you need. Those support techs will give expert assistance from your own help desk or live chats, but might be providing support for some other small scale business company like yours. Needs a tech support team available round-the- clock for prompt assistance from your own help desk or live chat or over phone for all cropped up incidents. The classic advice is to look for indicators that support is readily available 24×7 to safeguard your servers/services from downtime through proper monitoring tools. Sysally has hands on dedicated team and monitoring tools for your servers. Prefer to answer customer assistance through your HelpDesk system to provide the best possible support under your brand name. With white-labeled support team, you can establish your clients as a trusted expert in their queries/issues with accurate diagnosis and resolutions. SysAlly’s support engineers have the expertise to deliver pinpointed solutions specific to the issue in hand. In the world of servers, every single incident has roles and can take a multitude of shapes and sizes. Most of time the clients do prefer to get in touch the support over live chat for quick resolution on incidents, as it is more interactive and instantaneous support. SysAlly is totally aware of the value of a customer’s time due to an incident. We act as your support agents, and answer support requests and fixes 24/7. It saves valuable customer time by framing emails for every incidents/queries. Instant Responses for live chat need to be guaranteed round the clock. For tickets/email queries industry standard response time is 30 min. Means your clients should receive at least a canned response around 30 minutes of ticket being open, to let them know you’ve acknowledge the issue/request and dealing with it. Resolution time depends on the provider plans and complexity of the issues. It’s very important to keep the clients/end users posted especially on disaster management or server side issues. A very good or a bad user experience can both make or break anyone’s entire hosting venture. Usually all clients prefer and looking for experienced, friendly staff and branded support which can definitely be a perfect alternative on hiring their own full-time support staff. Sysally promises you to provide great opportunities to save your money and always be with you grow your company. When you choose our white-label support you are putting it in the hands of professionals. Then you can relax, concentrate on marketing or take a vacation and spend time with your family.